If you love candy or have kids that do, you probably either buy Skittles at your local candy shop or have seen then tucked in pockets wherever you go. Skittles is one of the most popular candies available. And while it was created less than 40 years ago, throughout the years it has been updated and marketed to always look hip and colorful. Here is the history of these delicious candies. Skittles was first introduced back in 1974 in American Markets. And as you probably have realized, this candy was loosely based on the M&M products that have a colorful candy shell and a chocolate center. However, Skittles was and still is a product that has a colorful candy shell and instead of a chocolate center has a center with a fruity, yet sometimes sour taste to it. In addition, where the M&M logo is found on M&M candies, Skittles prints a small “s” on each of its candies. While originally made in England, after becoming popular in the states, production of these bite sized candies moved to the US. Skittles is currently owned by the Mars Corporation, perhaps one of the largest candy makers today. this candy takes about 8 hours. At first the creation of the chewy center is created. This center is made primarily of sugar and other ingredients including hydrogenated vegetable oil, fruit juice, citric acid, natural & artificial flavors. Once the center is complete, these small bite size centers are tumbled and coated with a flavored sugar shell. The process is called panning. Then these shells are then polished and blended, then the infamous “s” is printed on each of the Skittles until finally it is packaged and made ready for sale. The original Skittles product comes in 5 different fruit flavors that include strawberry, orange, lemon, lime and grape. In the summer of 2004, Skittles was extended with the release of Skittles Bubble Gum. With a crunchy candy shell, the difference was a fruit flavored, soft bubble gum center. 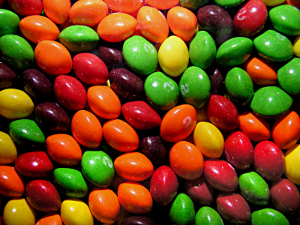 In addition, there are other varieties of Skittles available including: Skittles Bite Size Candies Original Flavor, Skittles Bite Size Candies Tropical, Skittles Bite Size Candies Wild Berry, Sour Skittles Bite Size Candies and Skittles Bite Size Candies Smoothie Mix which features smooth fruit combinations including orange mango and peach pear. Today, Skittles is sold in over 65 countries around the world. It still remains one of the most popular brand of candies available and it is manufactured in the Czech Republic for the European markets and in Victoria Australia for Australian and New Zealand markets. Skittles is known by it’s marketing slogan “Taste the rainbow”. 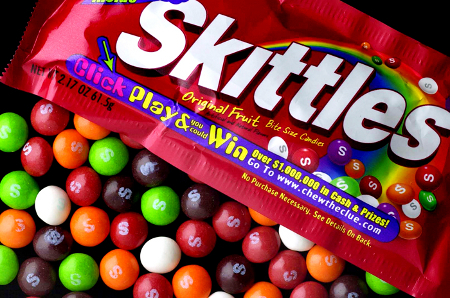 Recently in 2009, Skittles has launched a web based marketing campaign and has become more aggressively promoting their candies on social networks including Twitter.com. Fans or people interested in Skittles can access the Twitter feed utilizing the word “skittles”. A bit off with the grammar, but all in all very informative and satisfying. A job well done. I think that this is one of those types of describing that just makes your mouth water and long for Skittles. I believe that I have not read a more informative paragraph for a long while. Thank you for posting this online for the world to enjoy. I think the ad for your Skittles is so cute. Kudos to the agency that you hired!